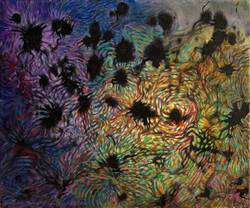 A celestial abstract, depicting the emergence of visual energies from the Dark Void that brims with potential. Vibrant numerous brushstrokes hug the edges of what appears to be dark stars that surge with high energy vibrations of juxtaposed colour complexes. Deep, mysterious and highly alive. Measuring 24" x 20" on stretched canvas wired and ready to hang. Sides are painted black. • Size: 24" x 20"